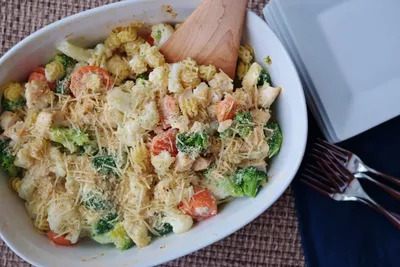 Cheese and pasta, meet chicken and veggies. Craving comfort food, but don't want all of the calories and fat that tend to go along with it? We all do, right? Well, here's a warm, creamy, and cheesy recipe that will satisfy each and every one of your taste buds without blowing your diet. Each serving is just 250 calories! A blend of vegetables (broccoli, cauliflower, and carrots) bump up the nutrient profile of this dish while keeping the calorie count in check. Even so, this recipe is in no way wimpy. Diced chicken breast adds a healthy dose of protein while low-calorie garlic and herb-flavored cheese infuses all of the wonderful textures and tastes you'd want in a comforting, casserole-type dish. 2. Defrost frozen vegetables and place in a large mixing bowl. 4. Meanwhile, add the diced chicken and cheese wedges to the bowl with the veggies. When the pasta is finished cooking, drain and immediately add it to the mixing bowl—the heat will help melt the cheese. Stir until the mixture is well blended. 5. Pour into an oven-safe dish and top with breadcrumbs and shredded cheese. Bake for 20-25 minutes.